Loreto Navan English: Our Day Out! 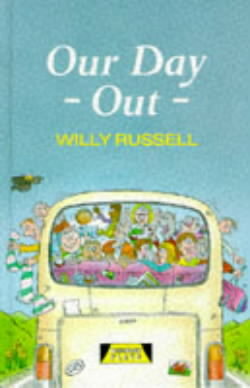 2nd year English students are studying Willy Russell's play 'Our Day Out'. To aid revision for their summer tests, Mrs Harney's 2nd year students Emily Muldoon and Lauren Kearney created a 'Glogster' inspired by the play! The play centres on a school trip to Conwy Castle in North Wales. Mrs. Kay teaches a remedial class for illiterate children, called the "Progress Class". The whole class - along with Digga and Reilly, the slightly older class bullies who used to be in the Progress Class - are taken on a coach trip. At the last minute, the Headmaster commissions Mr. Briggs, the authoritarian Deputy Headmaster, to supervise the trip. On the way to the Castle, the coach stops at a petrol station with a snack shop, where the students take advantage of the storekeepers' confusion to shoplift sweets and snacks, unbeknownst to the teachers supervising. It makes a second stop at a zoo, where the students enjoy the animals so much that they try to steal most of them. The zoo attendant discovers this just in time before the coach pulls out, and makes them return the animals. When the coach finally reaches the Castle, the students race around exploring the grounds, cliffs and beach. Soon it's time to leave, but one of the best-behaved students, Carol, is missing. A search ensues and Mr. Briggs finally finds Carol, who is depressed because she doesn't want to return to the bad conditions at her home. She wants a better life and wishes she lived in a nicer area, like that which surrounds the Castle. She becomes so upset that she threatens to jump off the cliff. Mr. Briggs, who up till this point has acted like a harsh disciplinarian, policing the students' bad behaviour and expressing doubts that they should even be allowed to have an outing, shows a more understanding side as he convinces Carol not to jump and to rejoin the rest of the group. The coach makes one more stop at a fairground where the students have some more fun before returning home. An even softer side of Mr. Briggs is observed, as he joins the students on some of the rides. He even goes as far as wearing a "Kiss Me Quick" hat, and joins in with the sing-song on the journey home, all of which is photographed by Mrs. Kay. She comments on how she never knew he had a softer side, and that he certainly wouldn't be able to get away from the fact now she had evidence. Being a keen photographer, he offers to develop the photos, and even convert them into slides so he can do a talk for the students. This is the perfect escape for Mr. Briggs. Not wanting to let anyone see his other side, once he returns to his car, he unravels the undeveloped films, exposing them to daylight and so ruining them, with a clear explanation of them "not coming out". Along the way, two young teachers, Susan and Colin, who are helping Mrs. Kay supervise, must also deal with the fact that Digga and Reilly have a crush on Susan while two older girl students have a crush on Colin. Susan and Colin solve their problem by subtly suggesting that Digga and Reilly should turn their attentions to the two girls. "Casablanca" on the Big Screen!